Ever noticed a mamma bird taking care of her just hatched chicks? While the chicks remain cozy and comfy in the warmth of the nest, she runs around fetching food, rushing back as frequently as she can to check on her brood. But soon, little chicks become big chicks all geared for their first flight! That’s when I wish mamma bird had a blog and wrote what must have ran through her tiny little birdie brain as she sees her chick standing on the edge of the nest, ready to spread it wings and take a plunge into midair! For the last two years and five months, KT has been like the just hatched chick. Except for a couple of times, when she was a baby, I have never been away from her. 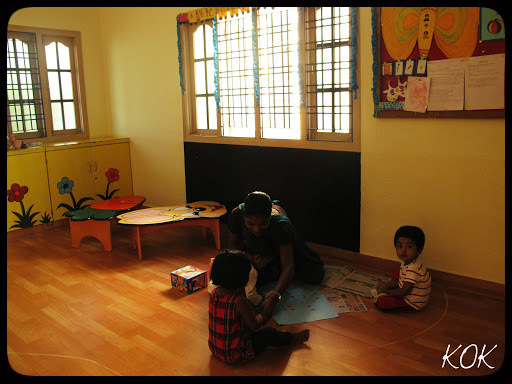 When it came to joining her a play school, I never thought it was a big deal, as it is phase every child goes through. The hunt for a playschool went on for a couple of weeks. Some of the play schools had such fancy, impressive websites. But when we walked in in person, we were completely disappointed – most of them were in small, poorly maintained apartments with dirty toilets or the teacher couldn’t speak English or very few toys and no hands on creative activities for the child. Thankfully, our search ended and we found a good school! Then the big day arrived – KT’s first day at school. The previous night I was so anxious that I hardly could sleep. How will she manage on her own? Will the teacher be nice to her? Will she tell the aayahma if she wants to go to the toilet? Such thoughts kept racing my mind! Morning came. KT sprung awake when I told her it’s time for school. She had a shower, got dressed up and wore her Giraffe backpack which her Athai Gammu gifted. The minute we neared her school tears began to trickle down her eyes, which broke into a loud cry as we walked her through the gate. As her teacher came and escorted her into her class, the cry grew worse. TH and I felt so bad. We walked back to our car and waited until we could hear her cry subside. The initial couple of weeks were difficult for both KT and me. Once she leaves to school, I was pre-occupied for the next two hours wondering if she was okay and happy. It’s been over a month now, we both have finally got ourselves used to this new routine. In fact, KT has begun to love school. She has made friends with her teachers, aayaahmas and van drivers. She returns home joyfully eager to unpack her little backpack to show me the craft she did that day. As for me, I enjoy two hours of solitude listening to music, watching the breakfast news and finishing up my daily chores before she arrives! What I’ve learnt through this process is that as much as we love our children, we can’t watch over them 24/7. There are times we should just let go of them praying and believing God is watching over them constantly. Each time a tiny worry crops in, I remind myself of God’s promises. Leaning on such promises has filled me with a great peace concerning KT. She’s got a long journey in front of her. She’ll go places I cannot accompany her. But I can be rest assured that she’ll be covered under His feathers and a host of angels with continually accompany her (Psalm 91)! and I know He watches over her!